Our company is based on a 19th century black smith tradition. Founded by Albert Grünenfelder sen. the company is still family owned. Over the years, we have developed from a farriery to a modern production company and expanded our business areas. Our company is based on a 19th century black smith tradition. 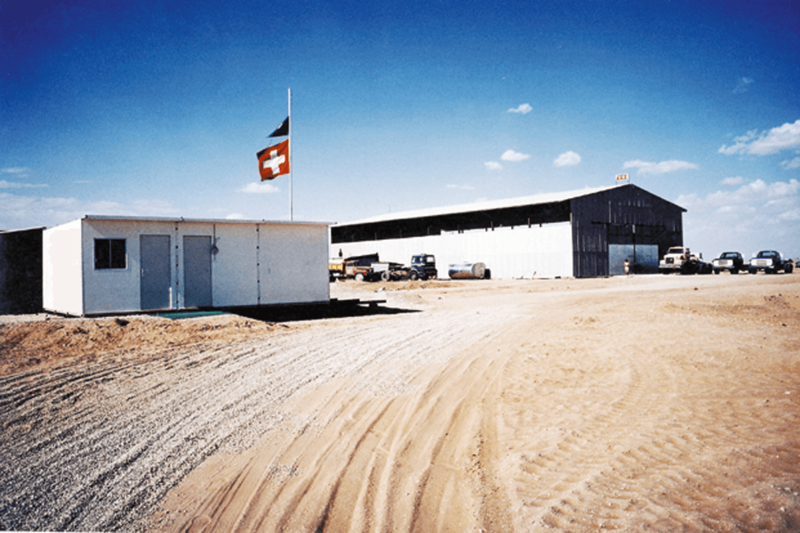 In 1948 Albert Grünfelder sen. enters his fathers black smith business and begins with the production of trailers for the agriculture and construction industry in Balgach. At the beginning of the 1950s father and son produced more and more truck trailers for the agricultural business. In 1955 Albert Grünenfelder sen. fully takes over the business and registers as "A. Grünenfelder mechanische Schmiede und Fahrzeugbau". Until 1964, the vehicles are manufactured in the original black smith workshop in Balgach. The place is soon to small and Albert Grünfelder sen. decides to transfer the production to neighboring Kriessern. The location is well accessible since it is located right next to a motorway entrance of the A13 motorway. A modern production hall and offices are built. The company continues to grow through high commitment and innovation. In 1965 the first double-deck construction for the transport of live animals (pigs) is finished. In 1966 Europe's first 16 t trailer in all-aluminum construction was developed and produced. Between 1967 and 1971, a large number of 3-sides 2-axle tipping trailers are manufactured. In order to meet the growing demand for piste bashers GK produces cabinets. 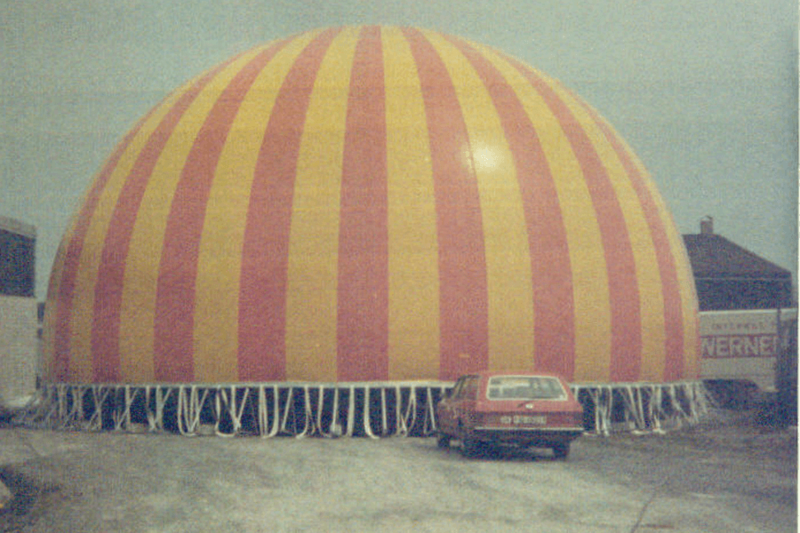 In 1973, the production site of Kriessern was extended by a 17x6x6m large painting booth. In 1973, the plastics processing plant in Kriessern was also taken over where the competences in the processing of plastic materials were developed. In order to harm the Western allies of Israel, various oil-producing countries are throttling their quantities of oil on the occasion of the Yom Kippur War. The oil price rises considerably what drives Western economies into a deep recession. The Swiss economy is also hit by the oil crisis. Business is stagnating or declining. Albert Grünfelder sen. is therefore looking for new markets and opportunities. He finds it just in the region where the crisis was triggered: in the Middle East. During an exploration tour and market research in Lebanon and Saudi Arabia, Albert Grünenfelder sen. notices the great potential for commercial vehicles and superstructures in this region. Together with Esmat Al-Saady, he founds the joint venture CGS (Consolidated Grünenfelder Saady) in 1976. With the help of many Swiss and other Europeans, Albert Grünenfelder sen. firstly sets up a plant in Riyadh. Material for the workshop and the living camp are mostly transported by trucks from Switzerland. Among the first customers are Swiss companies, which are also active in the Middle East. Soon the first trailers, superstructures and trailers leave the factory. The years between 1980 and 1990 are marked by a first modernization and increased orders for the Swiss army. 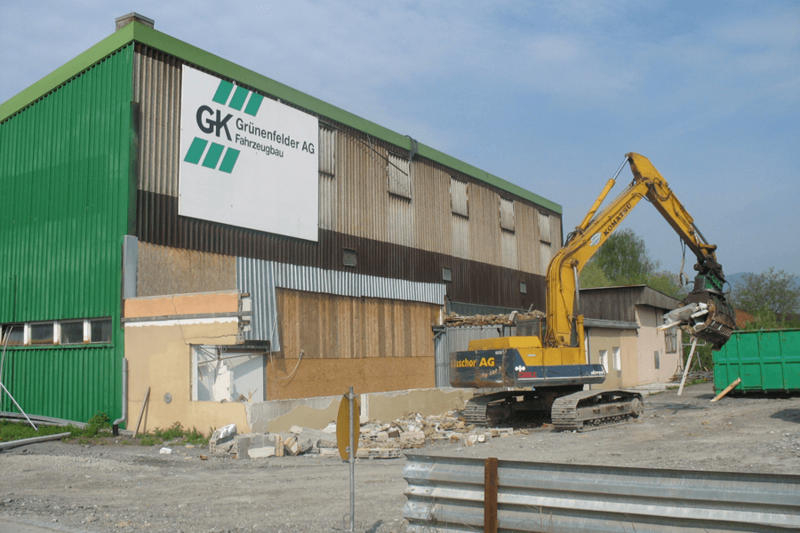 In 1984 the company GK Grünenfelder is converted into a stock company. In 1988 an additional hall for warehouses is built in Kriessern. At the same time the offices are rebuilt and expanded. 1996 the engineering office procures modern 3-D CAD systems. In 1997 the company receives a ISO 9001 certification. 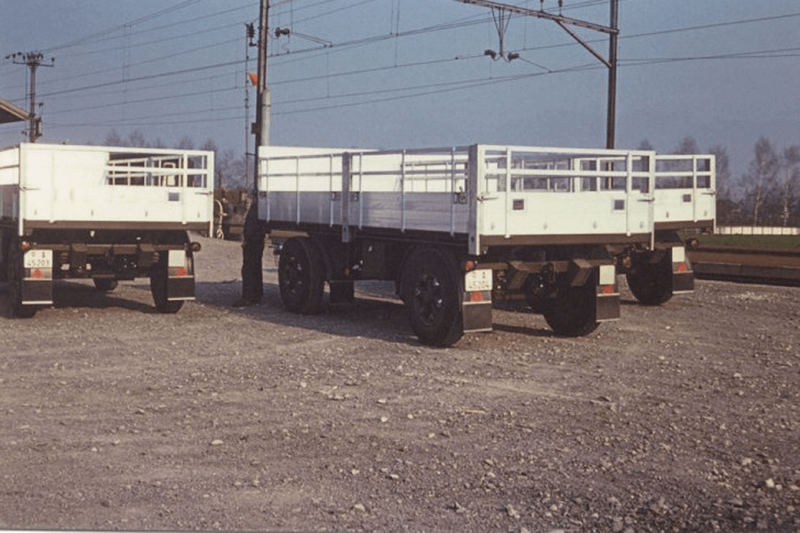 Already in the 1970s the company can deliver trailer series to the Swiss army. Further orders will follow later. 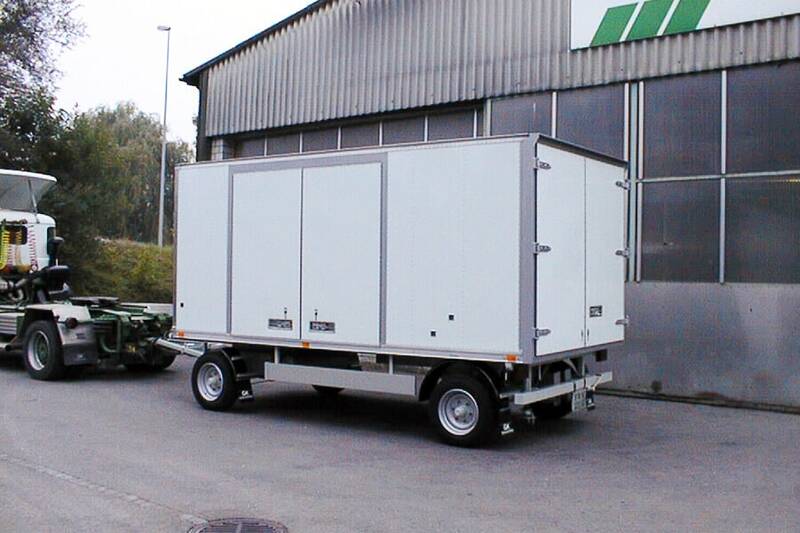 For example, in 1993 the company supplies 50 pieces of 1 axle trailers special trailers to the Swiss army. In 1995 a series of truck bodies for the Swiss army followed. Circues also order their vehicles at GK Grünenfelder. Among the most important orders are the production of 180° and 360° cinemas, which are very popular at this time. Circus Knie becomes a customer and regularly orders special vehicles from the 1990s onwards, including control cabinets, kitchen trailers, team cars, wardrobe trailers, mobile saddlery, mobile locksmithing and a carpentry. On December 24th 2004 the second generation of Marcel and Albert Grünenfelder took over the management of the company. Gradually, the new generation drives the transition to a modern production site. The following period is characterized by large orders of the German army and the NATO. 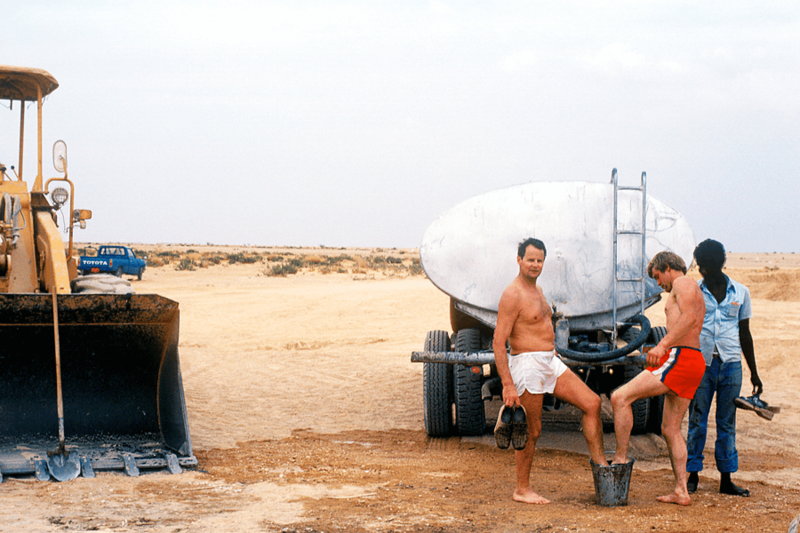 In 2001, ND Satcom commissioned the German Federal Armed Forces to order a special tandem trailer for the mobile use of parabolic mirror antennas type AFE. Further deliveries of these trailers follow in the following years. 2005 the development work for a mobile transmission module "TÜM" for the German Bundeswehr begins. 90 pieces of these units are finally delivered. Orders in the defense sector require restructuring and investment in the production infrastructure. The company grows with these challenges and has evolved from a craftsman to a modern production company. In 2007 a second factory premise opens at the Rheinstrasse. A 9-axis welding robot is bought. It can handle long components and carriers. In 2011, a 3-D water jet cutting plant will is purchased to prepare small metal parts for the production of superstructures, trailers and semitrailers. The production is being restructured and takes over the "modular production mode". This production saves time and allows vehicle chassis to be tailor-made according to the customer needs. The company can take over the momentum from the 00's. Since 2010, the company's product portfolio has been consolidated. The defense sector has become an important segment. In 2011 the company entered into a cooperation agreement with Fischer Frech-Hoch Estech and was awarded the contract for the production of 400 pieces of 4x4 and 6x6 Iveco superstructures for the Swiss army. In 2009 the factory premises at Zollstrasse is renovated. The building from the year 1962 is demolished to a large extent and equipped with new steel construction, roof and new façade on three sides. Thanks to the outstanding work of all involved parties, the production can be resumed within four weeks. Through the renovation, the production of the vehicles can be continued in optimal conditions. In 2013, the company acquired the property of Tapmatick at Rheinstrasse in Kriessern. The property expands the company premises by 4,000 square meters and allows parts of the production to be moved to the halls of "Werk III". In the meantime, the refrigeration sector is also becoming a major business field. 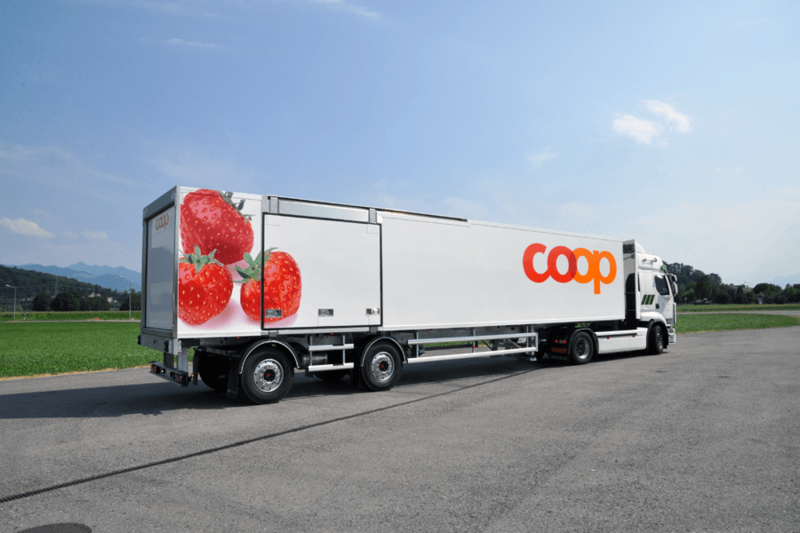 Almost all Migros cooperatives can be supplied with vehicles from the GK production. Other Swiss wholesale distributors Coop and Spar have become customers. They rely on the quality and functionality of the products of GK Grünenfelder AG. Today, the company serves customers in the areas of standard vehicle construction, special vehicles, refrigeration, defense and industrial services. The company is supplier of individual, high-quality and innovative mobility solutions for the road, factory premises and military logistics.